This conversion defense drill was contributed by Mo Dahkil, former video coordinator for the Clippers and Spurs to the FastModel Sports Basketball Plays and Drills Library. Rotations are extremely difficult to nail down and teams must drill constantly to make sure there is an understanding of who is rotating. The other factor that makes these rotations work is constant communication. The best defenses are constantly talking and communicating with each other. Another note when practicing the rotations, it is important to have all players practice every position in the rotation. It helps them learn what their teammates are doing but situations may occur where they will be in position. Editors Note from Brian: A point of emphasis on helping or trapping and then rotating from Kevin Eastman is that you want your defense to rotate and not scramble. Rotation implies having an organized system. Scrambling implies disorganized chaos. With more emphasis being put on “one more pass” from an offensive standpoint, it is even more important that defensive rotations be organized and practiced. Not to say that this is the exact system you should use, but my hope is that it will give you some ideas to apply if you do double the post and rotate out. 1 enters the ball into the post and then cuts to the WS corner. X4 can tag the 1 as they cut but should remain at the low HL position. X1 will go with the 1 and stop at the WS key. As the 2 will slide over, X2 will become the one responsible for doubling the post. When X2 goes to double, this forces a few rotations. X3 will move to the high HL position and is responsible for any pass to the 2. The X1 will slide and maintain an equal distance between the 3 and 1; they are responsible for any pass out that way. X4 will remain in the low HL spot. The defense is willing to concede the pass to the 2 because it is the easiest to recover to. The second rule defines who is rotating where. In the previous example X1 rotated to the 1 because he was in between the SS elbow and the sideline. If the 2 passes the SS elbow then the first example of rotations is intact and X2 will rotate to his man. The ball is kicked out to the 2, and as the offense swings the ball, X3 takes the 2, X1 takes the 3, and X2 leaves the double team and sprints to the 1 in the corner. Whoever doubles the post will have the longest distance to cover but should be able to get there as the ball is swung. An adjustment can be made, and teams could have X4 take the corner and X2 rotates to the 4 if the team is comfortable with the match up. 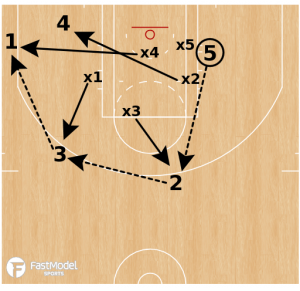 When the 1 cuts through our 2 (our best 3 point shooter) simply roates into the void left by the 1…ie., the SS wing, receives a kick out pass from the 5, and cans the uncontested three. 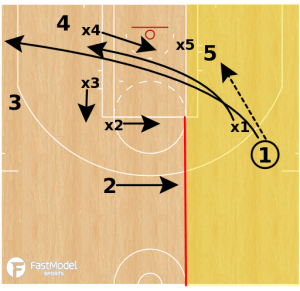 BTW, our 2nd best 3 point shooter is our 3, who rotates into the void left by the 2…Ergo if you doube off of the 3, you will have a similar problem. We have made it to the New England Prep school Final Four each of the past 5 years, basically will a philosphy that if we have a low post scorer who can’t be guarded in single coverage and at least two 3 point shooters on the floor…then we can’t be stopped. We getting doubled in the post about 80% of the time, and none of the schemes that we seen can really stop us. And for the 20% of the time, our low post gets single coverage, his scoreing skyrockets…and his assist count evaporates. 3x has got to know that your 2 is a shooter and cheat in his direction and be moving to your 2 on any pass out or even be in a deny position for a possible steal of the pass. 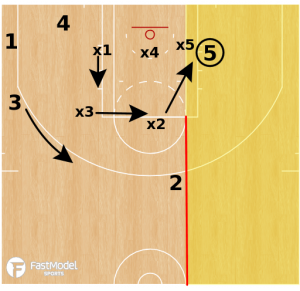 Same thing with guarding your 3, my 1x needs to be ready to cover with the look from your post. If my 2x, that is doubling down, has good arm length they should be mirroring the ball to make it difficult to pass out to the 2 or the 3. Your players have to learn to compete. They have to learn to anticipate and react quickly. They have to be moving with the pass, or before, but never after the pass. A competitor will always hustle, but a hustler doesn’t always compete.